The Friends of Lake Williams (FLW) conducts a lake clean-up every year. Volunteers and boats meet at Second Beach on Lake Shore Drive at 9:00 AM. Volunteers may be on or in the water or on the shoreline on foot, particularly near Route 207. Each boat is assigned a specific area of the lake to pick up all manner of debris. 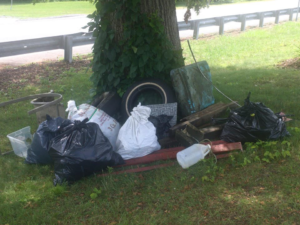 The the lake clean-up has been successful in eliminating tires, chairs, bed frame, Styrofoam, wooden post, metal stripping and many other items. In excess of 5 bags of beverage containers were also removed. The sad news is people continue to litter. Thanks to the many volunteers who helped with the clean-up! Prior arrangements are made with Lebanon town officials to pick up and discard the refuse. In addition to the event being worth while and productive, it is a great way to meet your neighbors. Check announcements on this website and Facebook for future dates and time.